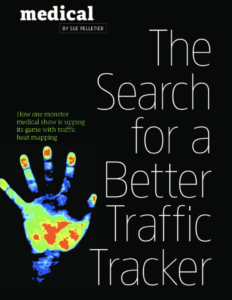 Sue Pelletier regularly writes articles for medical meeting planners and just published “The Search for a Better Traffic Tracker” in MeetingsNet. The article discusses Digestive Disease Week’s (DDW) approaches to gathering attendee traffic patterns. In 2017, DDW implemented EventPilot’s Traffic Tracking to display an anonymous heat map traffic data in real time. While traffic tracking via RFID is expensive and typically does not provide a benefit to attendees, EventPilot is different. Collecting data is very affordable and attendees have the added benefit of indoor positioning and navigation to find their way through the vast tradeshow and poster halls.